Holy Crap Batman.. the next instalment in the Haapsalu Shawl book series is out. and is it ever fantastic! - As if the first book wasn't full of wonderful as it was. the second one is full of treasures and jaw-dropping incredible lace motifs. - The previous publication was released in both English and Estonian, but this one is bilingual, with the pages divided up between the languages. Even so, it's still very readable and the print is nice and large. Some of the charts are tinier, but honestly, if you're crazy enough to try knitting these with thread and tiny needles, I doubt a small print chart is going to scare you off. just sayin' ! - More than just a lace dictionary. 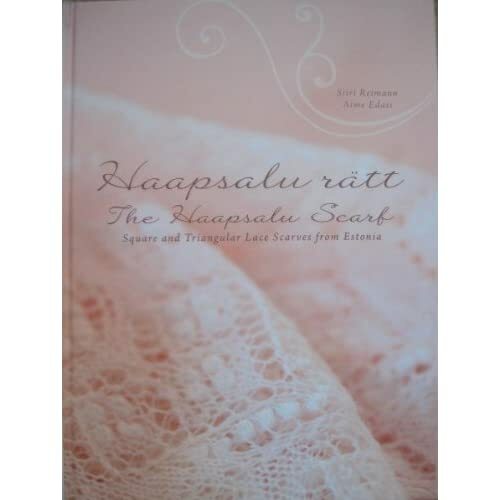 while full of charts and descriptions of different lace motifs and styles, this book also contains FULL patterns for many different scarves (FYI, in the Estonian tradition square and triangle lace is defined as a "Scarf", and a long rectangular stole is a "Shawl") and several formats for putting them together too. from the basic sewn on edging traditional format, to the more contemporary knit on borders and corner-miters. - I've only flipped through the book a half dozen times so far. and not actually knit anything out of it yet, but I can tell you this: The photography is fantastic, the historical details are fascinating, and the lace itself is breathtaking. The first book was very well done, and I was able to knit actual projects from the basic schematics and charts alone, so I can only imagine how much easier it will be to get started on these where there are full patterns with stitch counts, layouts, etc. - if you're thinking about buying this book: Stop thinking about it and just do it. Worth. Every. Penny. I'm completely in love! A Facelift. Look Ma! I got a Makeover! So… you might be seeing some more changes around here, but don’t worry! I’m still working on lots of goodies and can’t wait to show you all what’s going on.